Today I’m finally sharing a fun tutorial with you all (ya’ll!). (Download the PDF of the tutorial here.) 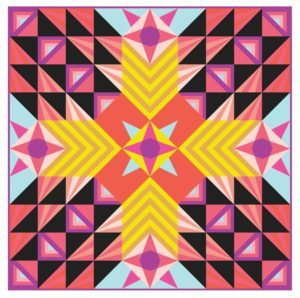 My idea for quilt-as-you-go (QAYG) applique has been floating around in my head for over a year. 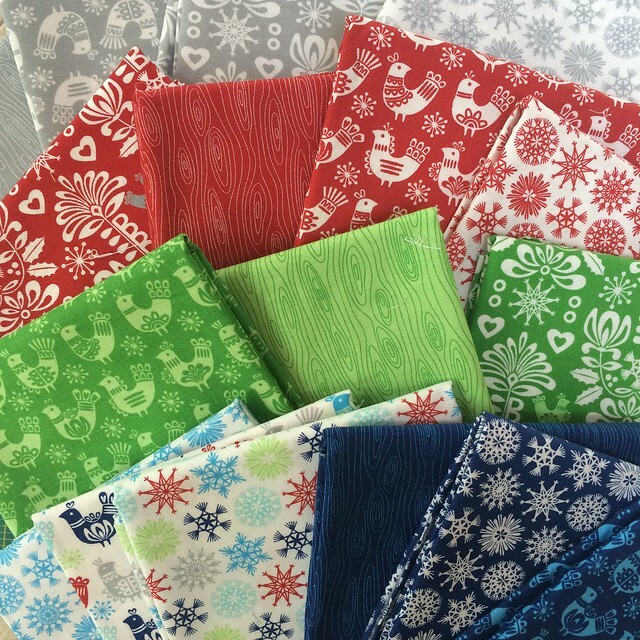 So when asked to join in on the Christmas in July Blog Hop with Gina Martin’s new fabric line, Folk Christmas, I knew I finally had a chance to play around with this idea. 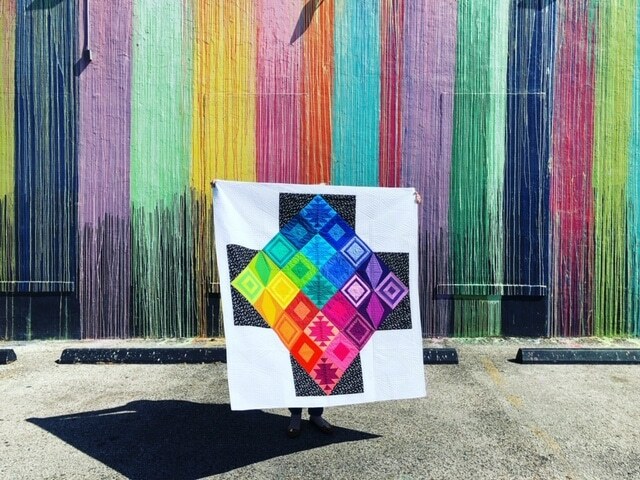 I, perhaps like you, heard about QAYG a few years ago from the online quilting community. It is such a fun and versatile technique. Lending the QAYG technique to applique just seems like a great use of QAYG, let alone all those extra batting scraps lying around my house. 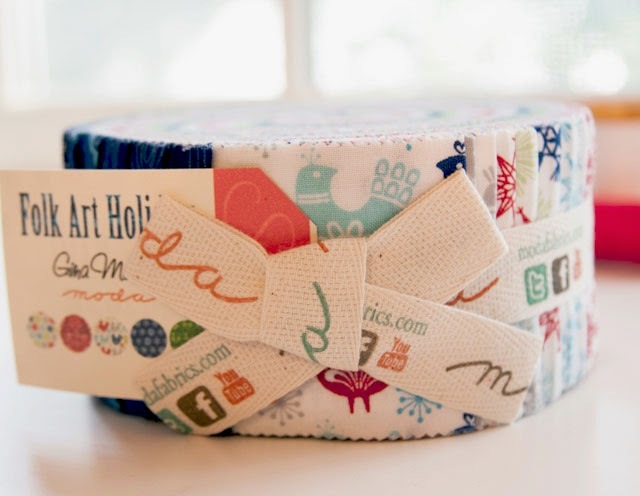 Before getting to the tutorial, I want to let you know I am giving away a jelly roll (well Gina is giving away a jelly roll). If you want a chance to win (international entries welcomed), leave a comment telling me about your favorite Christmas cookie (mine is Gingerbread… mmmmm….) Winners announced July 31st. This giveaway is now closed, but I’m leaving comments open just in case there are questions about the tutorial. Ok, if you are here for the tutorial… let’s get started. * From the 1/2 yard backing fabric cut 2 pieces 16 1/2” x 19”. Place a green strip right side up along the center of the batting square. 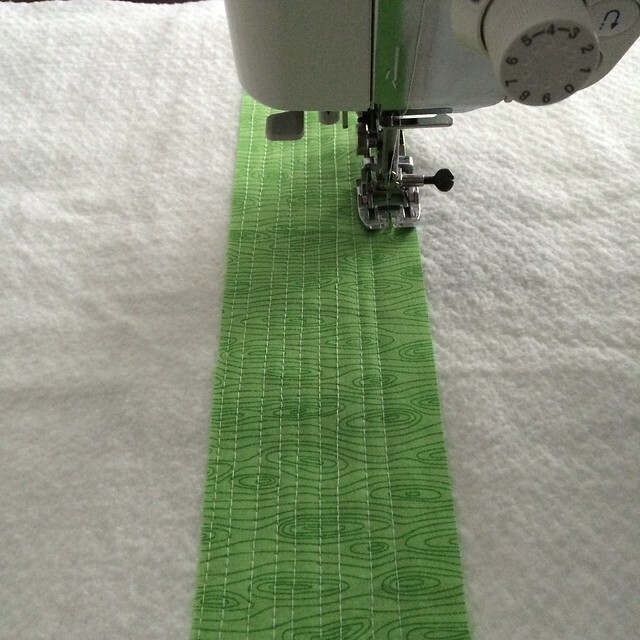 Then using your walking foot, run several lines of straight line quilting along the strip. 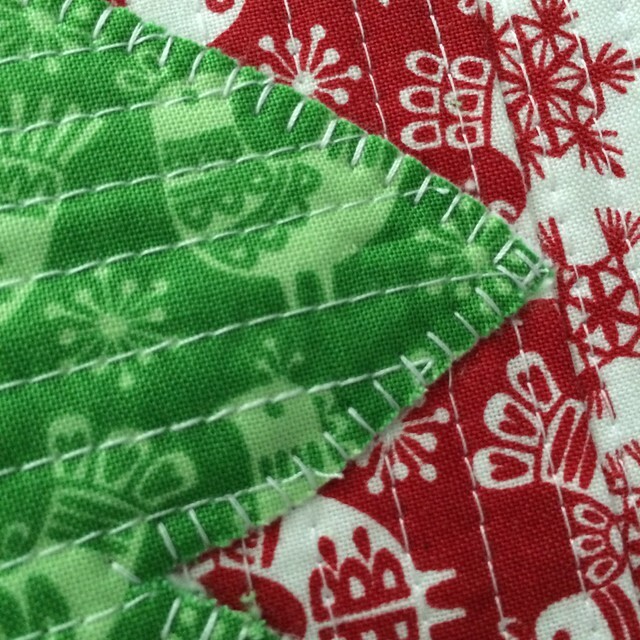 When quilting, I increased my stitch length to 3.5. My quilting lines are roughly 1/4” apart. 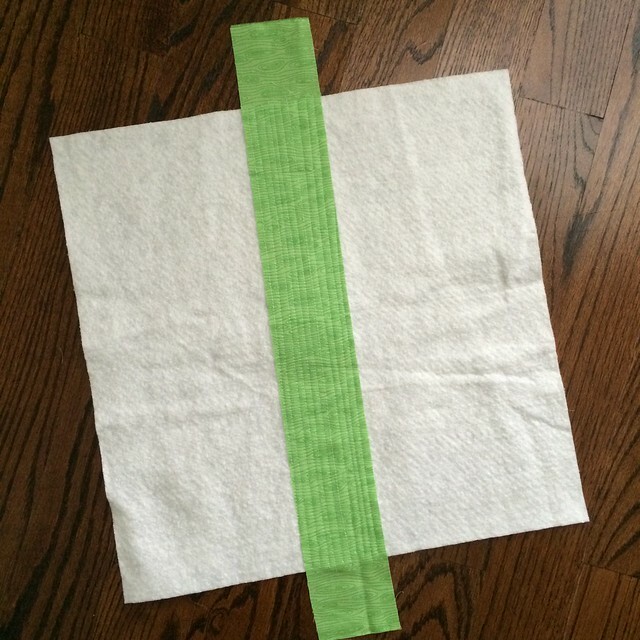 Place a second green strip on top of the quilted strip so that right sides are together and the raw edges are aligned. 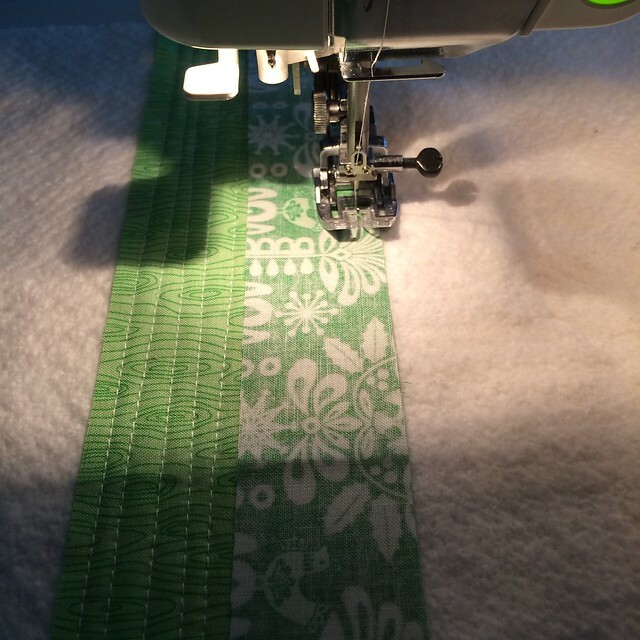 Using a 1/4” seam allowance, sew the strips together. Note: you will be sewing through the batting too. Then press the second strip to the side. Quilt the second strip as desired. 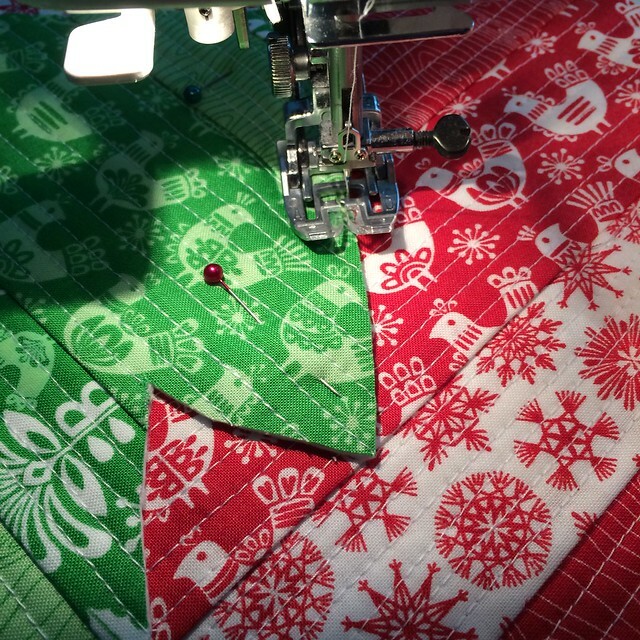 I chose to continue the same straight line quilting. Repeat Steps 2 and 3 to finish add green strips to the batting square. Make a second QAYG panel in red by repeating the process. Then square the background (mine is the red) square 10 16 1/2”. 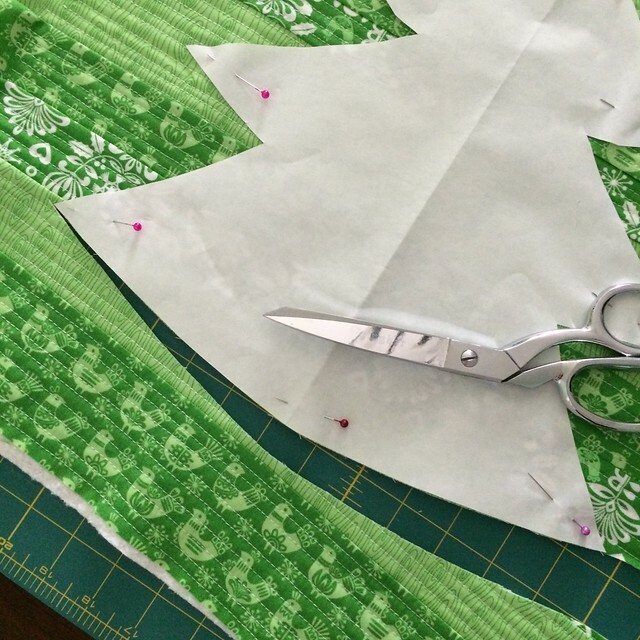 Now, you will cut a shape from one of the panels to applique onto the second panel. 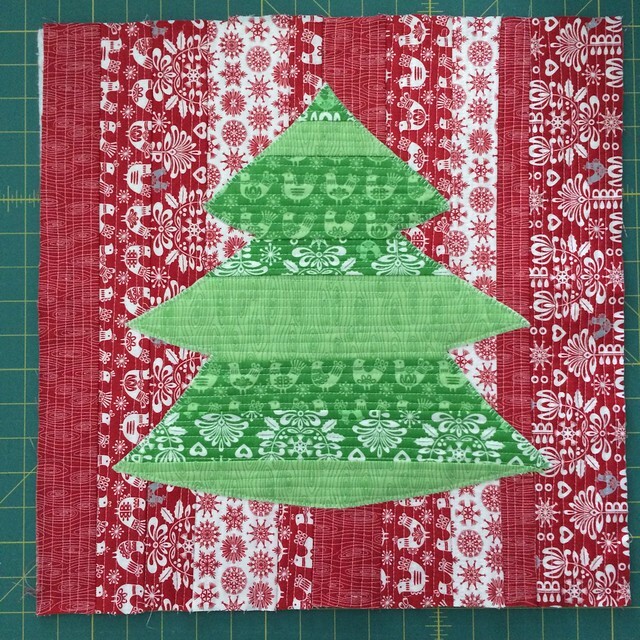 I chose to cut out a tree shape from my green panel to applique onto the red panel. 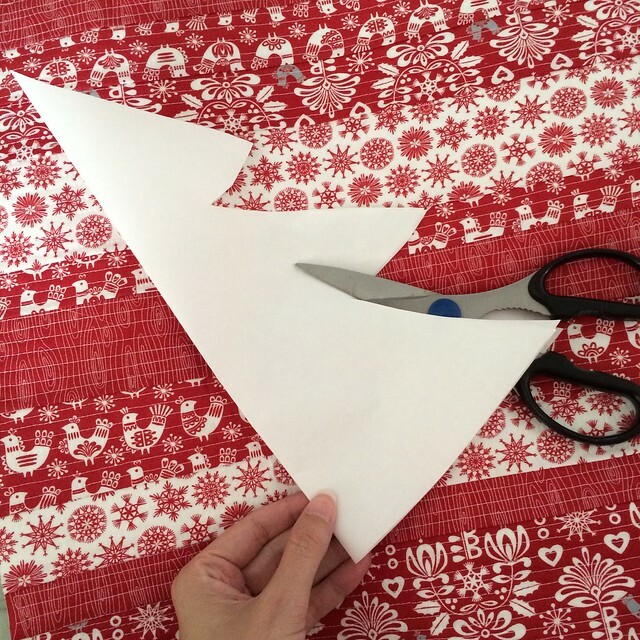 Using freezer paper or copy paper, draft and cut your desired shape. I drew a tree. In these pictures, you can see a bit of my process. I’m using the red panel to gauge how large I want my tree. (I wished I’d made it a bit smaller, but que sera!) In the picture below, I’m satisfied with the shape and size of my tree. 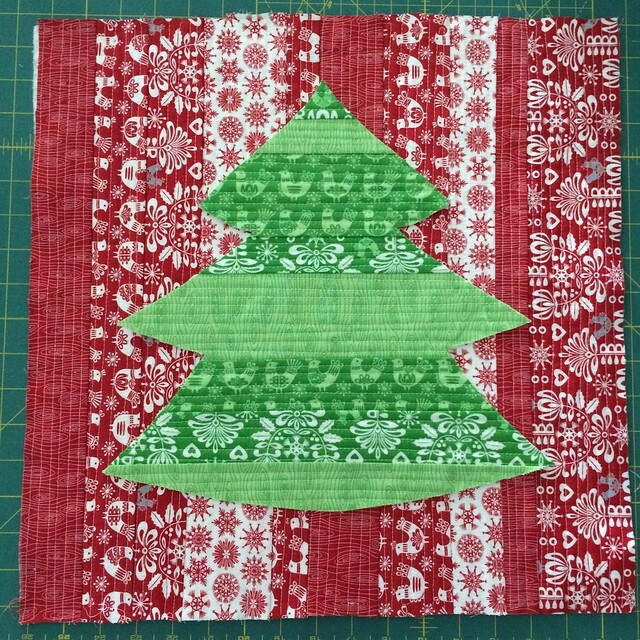 Once you’ve settled on shape and size of your object, pin the paper to the panel to be appliqued (in my case the green). You can also trace the pattern using a washable fabric pen. 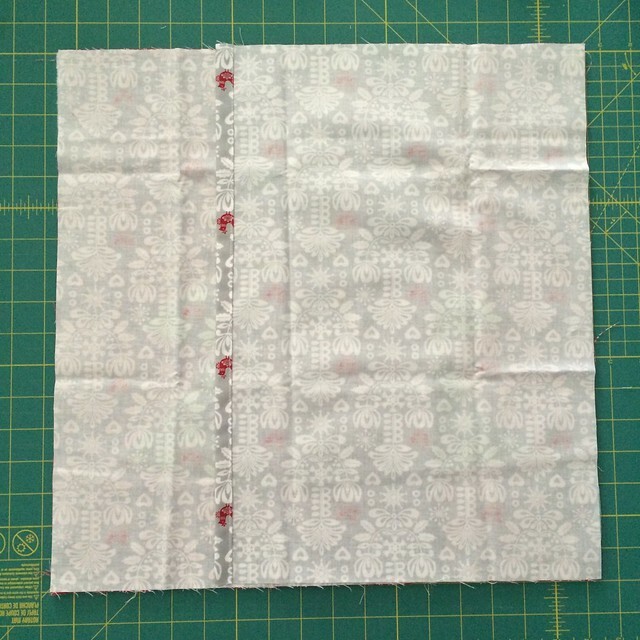 Some things to think about as you place your pattern: Which way do you want the quilting or pieces to be oriented? You also may want to be sure you aren’t getting a tiny piece on the very edges of the pattern. I made sure the top of my tree was well into the strip and not just barely. A small piece will likely be problematic. These are not deal breakers by any means, but some things to consider. 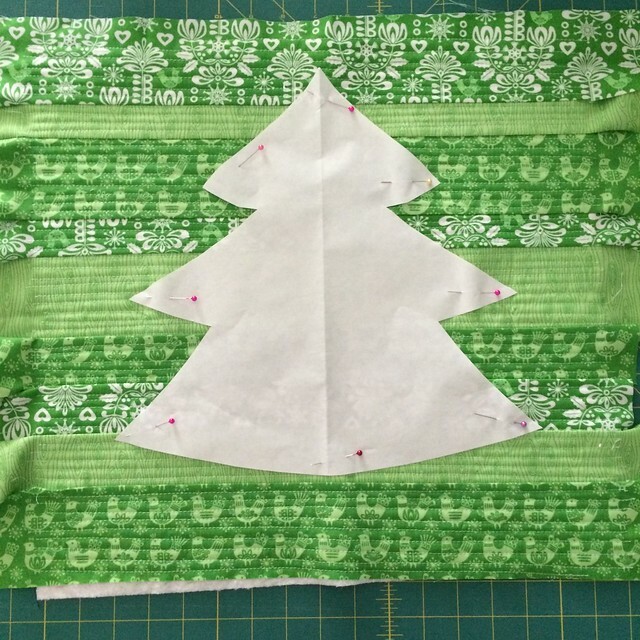 Things to think about: How do you want your background quilting and strips oriented? 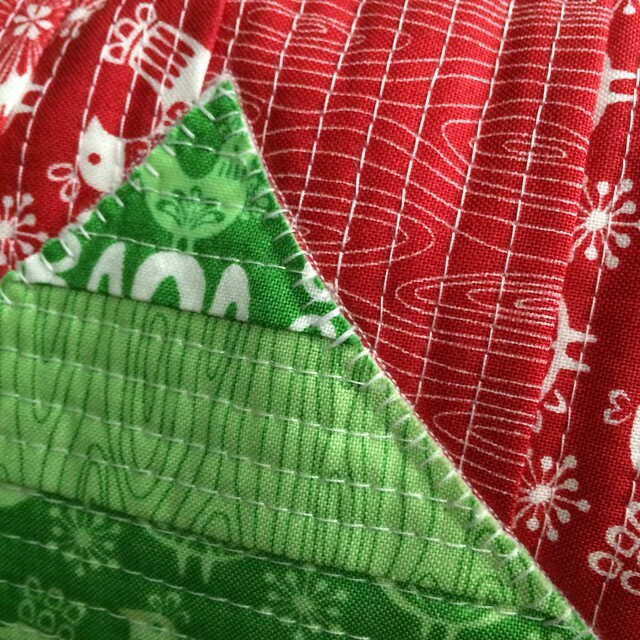 I oriented mine so that the quilting is perpendicular. Do you want it centered? And remember you will lose a bit off the sides in the pillow seam allowances and from pillow puff. Applique the piece to the background panel. I used a blanket stitch on my machine. Loved it! And now to finish that lovely up into a pillow! 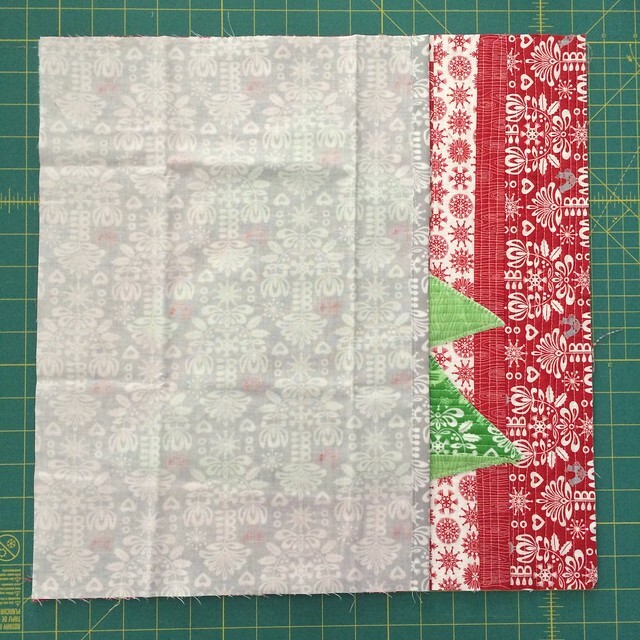 Make the back envelope pieces by pressing a raw edge under by 1/2”. Fold it under again by 1/2” and press. Then top stitch to secure. Do this to both halves. Lay out the pillow top, right side up. 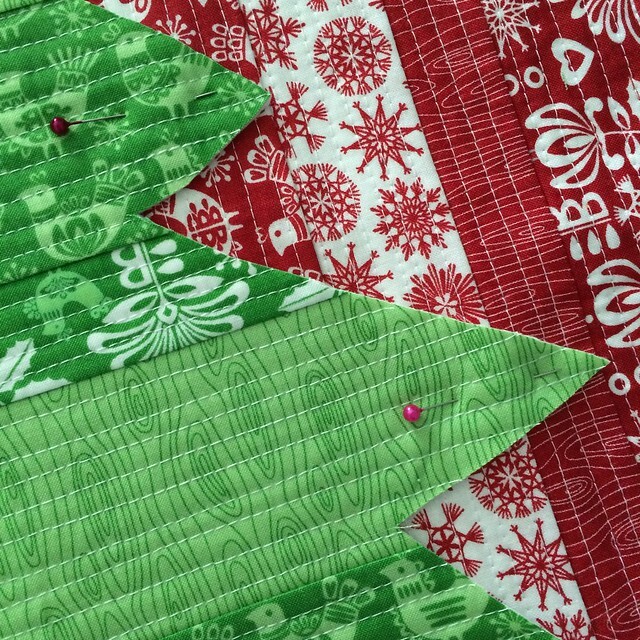 Then lay one side of the envelop back right side down on top of the pillow top. Align the raw edges with the raw edges of the pillow. 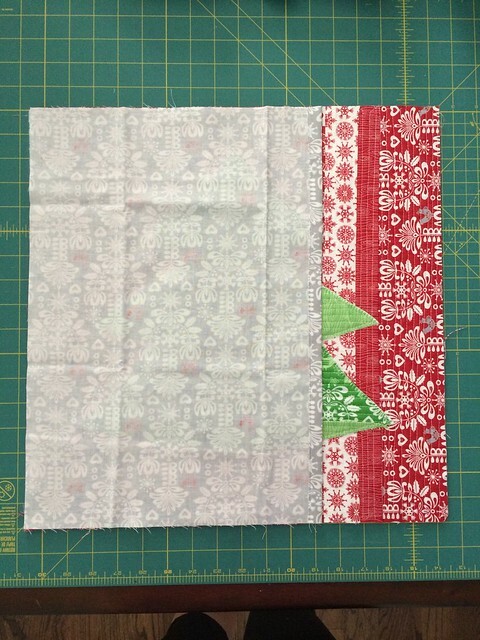 Lay the second half of the envelop back right side down and aligning the raw edges to the other side of the pillow top. Pin well all around the outer edges. 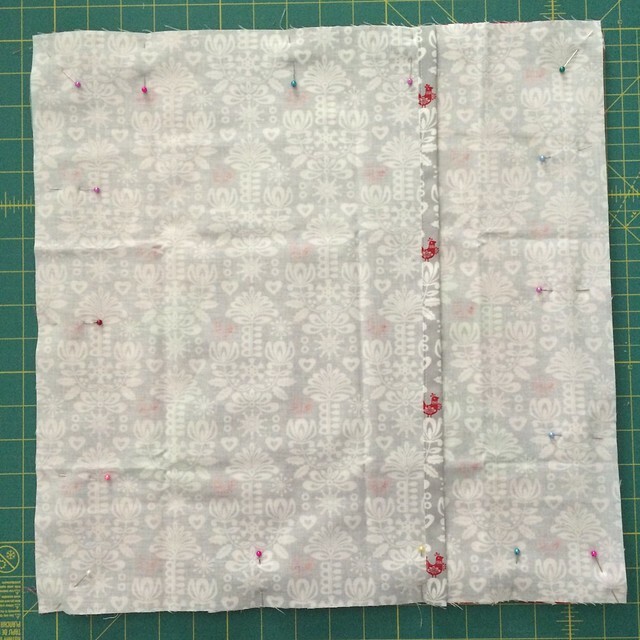 Stitch all around the outer edges using a 1/4” seam allowance. Backstitch when starting and stopping and also backstitch when stitching over where the backing pieces overlap, for extra security. But seriously, this technique is so versatile. I think one could have a lot of fun with it. I’m thinking letters, puppy dog shapes, birds. You name it. Go wild! And please please do show me! Download the PDF of the tutorial here. Love the pillow! My favorite Christmas cookie is my grandmother's French Cookies. They're really fried dough rolled in powdered sugar. No calories there! I love the pillows, Rebecca! I need to try this technique! Great tutorial! My favorite Christmas cookies are Molasses Sugar cookies. Thanks for the generous giveaway! we call them snowball cookies. 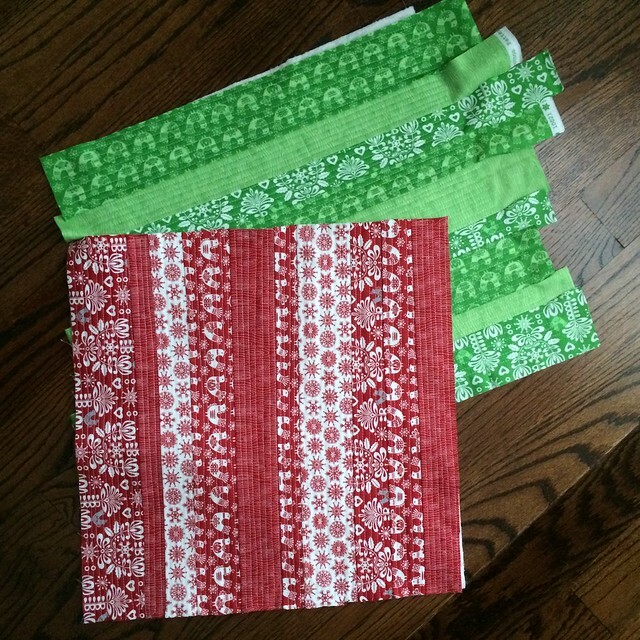 I LOVE quilt as you go projects and these pillows are ADORABLE!!! My favorite Christmas Cookies are frosted and decorated cut out Christmas cookies. Too pretty to eat but you do anyway!!! Tea Ball cookies! Also known as Mexican Wedding cookie or snowball cookies. Love the pillows!! My favorite Christmas cookie is Snickerdoodles! 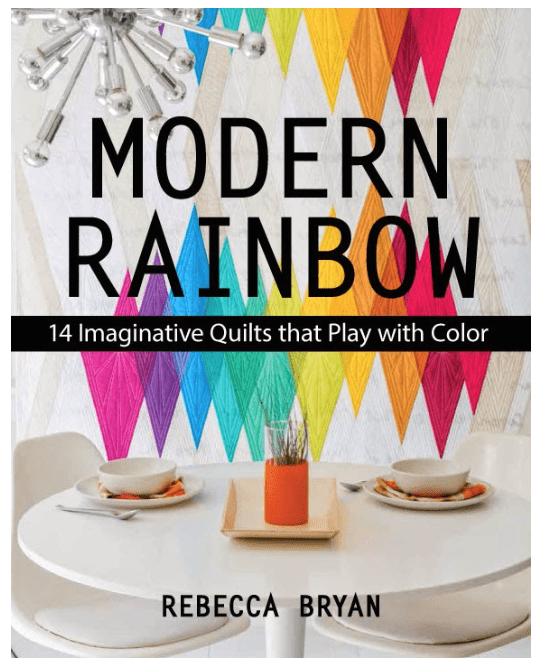 This looks like a fun fabric line, thanks for the giveaway! Love your pillows. 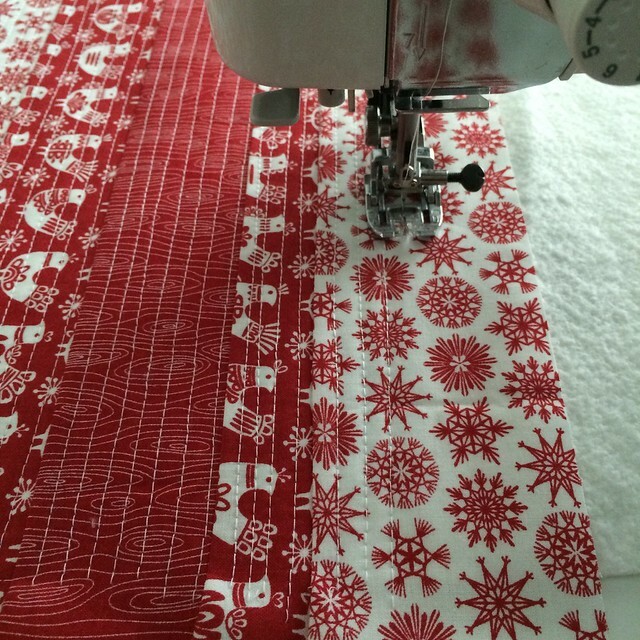 I love this method of quilting. My favorite christmas cookie is cream de menth e bars. They are so delicious. Sugar cookies are my favorite Christmas cookie! This is a very cute pillow! I can see this with other holidays or for a child room. So many ideas and so little time! Now for my favorite Christmas cookies. I actually have 3 that I have made for 41 years that Christmas isn't Christmas without them. My cut-out iced cookies, peanut butter kisses and Mexican Wedding cakes. I have wonderful go to recipes for each one. My family requests them every year as well. My favorite cookie is Snickerdoodles….love the cinnamon!! Gorgeous pillows! Thank you for the tutorial! My favorite Christmas cookie is the Stained Glass Cookie. A basic sugar cookie dough that you shape and put crushed hard candies or suckers in the center and bake. My boys used to have so much fun making little stockings and star shapes when they were younger and now that they are in their 20's they still ask to make them every year! Spectacular pillow! Thank you for the great tutorial. My favorite Christmas cookie is a raspberry kolacky sprinkled with powdered sugar. Thumbprint cookies are my favorite Christmas cookie. Thanks for the great tutorial. Your cushions are fabulous !! Love your pillow! My favorite Christmas cookie is Spritz. My favorite cookie comes from my Great Grandmother. It is her Molasses cookie. My mom made them every year and I learned from her. I make them every year and they are a favorite of my family. Cookies carry a history and a story of their origins, making warm memories to share along with the recipes. Thank you for the fun and informative tutorial. I'm going to try and make this. I love these pillows! The pattern would work well for placemats too! My favorite cookie for Christmas has to be the chocolate chip with pecans! good all year! I love those pillows I am definitely going to have to make these. Thank you for the great tutorial. I love sugar cookies with icing. HI, my favorite Christmas Cookie is the Date Pinwheel. 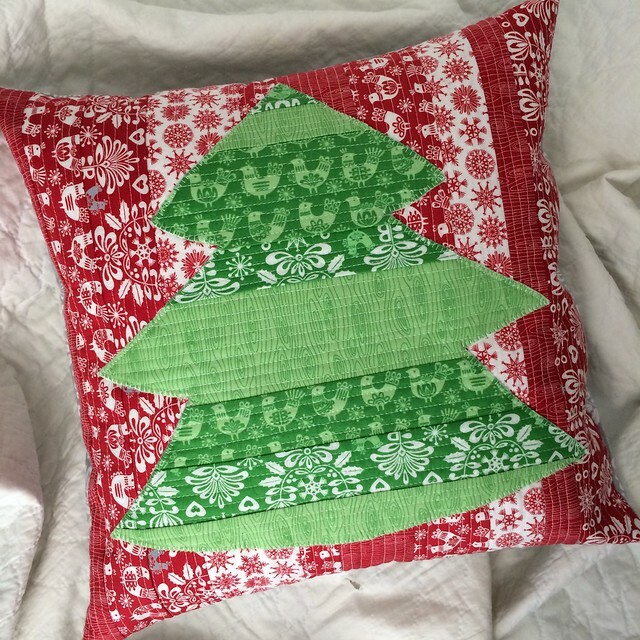 Love the Christmas Tree Pillow tutorial! Thank You for a sweet Giveaway too! Thanks for the tutorial. My favorite Christmas cookies are decorated sugar cookies. Adorable pillow! My favorite Christmas cookie isn't really a "Christmas" cookie, but it is a 3 layer called either a Venetian or Rainbow cookie – since they're so complicated to make I only do it at Christmas when I have the time to devote a day or two to baking. Great project, thanks for sharing! I love old fashioned sugar cookies w/icing! I love the sugar cookies my mom makes from her grandmother's recipe. She had to swear on the Bible that she would ALWAYS use REAL butter! She always has! I love my mother's date-nut pinwheels. Very cute Christmas pillow. My favorite Christmas cookie is one my MIL taught me to make — Hungarian nut cookies. They're lightly sweet with a meringue nut filling — yummy!! How fun! I need to learn more QAYG techniques, since I have a small machine. I love Christmas cookies. My hubby loves butter spritz cookies, and I found a recipe to make gingerbread spritz cookies–make us both happy! I also love toffee bars and fudge. My favorite cookie is a chocolate thumbprint with a cherry in it and chocolate frosting on top. The favorite cookies in our house is the Almond Joy cookie, as well as a Rocky Road Fudge Bar. My favorite cookie is the sugar cookie. I have used the same recipe for the past 14 years. Your tree pillow is very cute, thanks for sharing. I love my moms thumbprint cookies. They are like a shortbread cookies with a small amount of strawberry jelly in the well made from her thumbprint into the cookie. Macadamia shortbreads cut into Xmas shapes , love your pillows ! Great pillow. My favorite cookie is krumkake—especially the ones that my Aunt Bergit use to make. My favorite cookies are the thumb drop Hershey kiss cookies. I love this tutorial so much and plan on purchasing some in the near future. Thanks! Super cute pillows!!! My favorite Christmas cookies are Norwegian Kringla made by my momma and aunties. 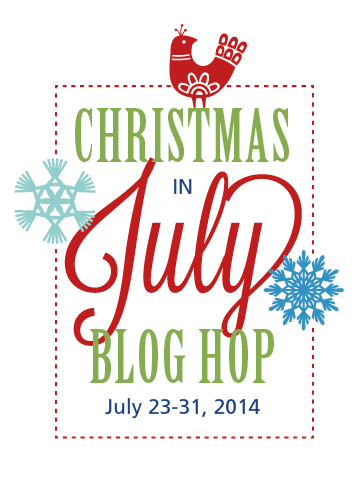 I'm going to have to bake some now – Christmas in July. : ) Thank you for the giveaway! These pillows are adorable. So simple but such a nice look to them. Cookies?? All of them really but anything with molasses is a good choice. My favorite cookies (not only at Christmas time) are chocolate chips cookies. My favorite Christmas cookies are gingerbread men! I love the QAYG technique.. I love your pillows – so cute and the look quick and easy. My favorite Christmas cookie is shortbread with white chocolate chunks and dried cranberries. Thanks! My favorite christmas cookie are the peanut butter blossoms. Thank you for this tutorial. Love this pillow and love this line. Ive always wanted to QAYG and now I have a project to try. What a beautiful pillow! Sure to brighten any holiday home and thanks so much for the really great tutorial! Super inspiring!! Love your pillow! My favorite Christmas cookie is a spritz cookie. 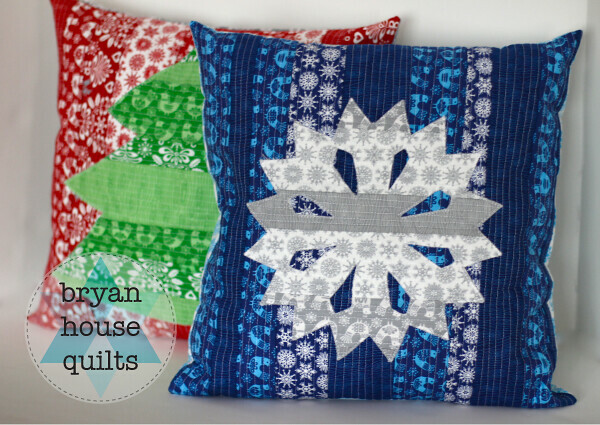 Cute Christmas pillows! My favorite Christmas cookie is a really thin crisp sugar cookie with a thin layer of icing. I love the snowflake cushion in the first photo. My favourite christmas biscuit is shortbread. I love the shaped sugar cookies. My favorite Christmas cookie is homemade shortbread cookies dipped in chocolate. They are so delicious and a tin of them makes a great hostess or teacher gift! My favorite Christmas cookies are my grandmas biscochitos. They're a Mexican cinnamon shortbread cookie! LOOOOOVE your Pillows!!! Thanks for the Tutorial too!! We always make Cut-out Christmas cookies & ice them & SPRINKLES of course!! Yummy!!! mine is these dark chocolate stars that they make for Trader Joe's. Soooo addictive! LOVE, love! love that pillow! My favorite cookies are sugar cookies! Beautiful pillows! Thanks for the tutorial, and for the chance to win this lovely fabric. I love sugar cookies in Christmas shapes with frosting and sprinkles. Wonderful pillows! Sugar cookies at my house, always the favorite. My favorite holiday cookies were the Stella D'Oros my great-grandmother used to buy (yup- no cooking in my family!). Chocolate fudgie centers with butter cookie around it. so many different ways to eat them. mmmmmmmmmmmmmm. Love the fabric you chose for the pillow! My favorite Christmas cookie is spritz! Sweet pillow. Always sugar cookies, yum! Thanks for the giveaway. We always had to have Russian Tea Cake cookies. Yum! I really like the patterns in this print collection. Pretty pillows. Thanks for the chance to win. Christmas isn't Christmas without shortbread dipped in chocolate. My momma makes the BEST gingersnap cookies. YUM. Well my favorite christmas cookies? Cinnamon stars, a traditional german christmas cookie – yummy! Just found your website and am excited to try a few of your tutorials! My fav Christmas cookie is my gramma's recipe for a shortbread-type cookie with ground nuts. Yum! My Gram has a recipe for orange cookies which are basically mini orange chiffon cakes. They are a lot of work, but really delicious so sometimes I make the time. I make pumpkin muffin cookies with raisins and I just love these. I got the recipe from a coworker's wife some years ago. My favorite cooky recipe is for cut out sugar cookies which can be used year round. Genius! I want to try this. As for cookies, Mt sister makes some super yummy pecan bars. Mmm. Nice technique-I'll have to try it! As for the cookie, thhat would have to be sugar cookies with icing and sprinkles! My favourite Christmas cookie is chocolate shortbread. Yummy! I love gingerbread cookies too though my favorite to ice are sugar cookies. This is cute and great idea, I like plain ol' sugar cookies, with frosting please! Although I've enjoyed making traditional Spritz cookies for 30+ years, recently added a drop cookie to my Christmas cookie repertoire. It uses Oatmeal, dried cranberries and white chocolate chips. I like it better than the Spritz. They're colorful for the holidays and delicious, too. Thanks for the tutorial. I appreciate your QAYG demonstration. Thats a nice technique! Definitely one to try. We don't really go for christmas biscuits in this house, but I did a couple last year when a freind bought the kids a kit. Ginger biscuits with a stained glass shaped cutter and a boiled sweet to go on top a melt into the coloured glass. Very cute and it gives a real crunch when you bite through. I have to say I do love a good Gingerbread cookie but it has to be really spicy! Second best is a Snickerdoodle! I love iced sugar cookies. i love a cookie my mom used to make called a czechoslovakian cookie. it is a bar cookie with a layer of strawberry jam between layers of a very yummy butter pecan shortbread. yum! My favorite Christmas cookies are called Sugar Diamonds. They are a rich buttery shortbread with a sugary pecan topping. Great tutorial. I really had no idea how you did QAYG, now I'm intrigued as to how other projects would go together. My favorite Christmas cookie…haystacks!! YUM! Thank you for the tutorial! My favorite Christmas cookie is whatever I get to make with my kids. With one in college, one headed there in the fall and one still at home. The time I get to spend with them is what I cherish. Each has her/his favorite, which makes it mine……Candy cane cookies, Gingerbread men/women, and chocolate mint. I have never tried to make a pillow before but it would be fun for Christmas. My favorite cookie is the one with corn flakes and melted marshmallows (tinted green), formed into a wreath, with red hot candies for holly berries. Russian tea cakes. 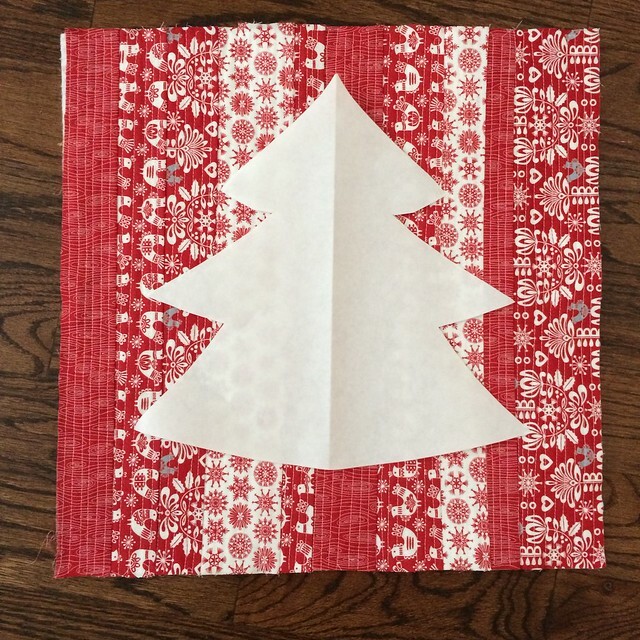 Love the tutorial and the christmas prints. My favorite cookie is a powdered sugar nut ball. (My Mom used to make them every year – and now I bake big batches and mail them to all of my children.) I love your cute tree pillow! I love my moms Bird Nest Cookies – they are filled with raspberry jam! thank you! Your tree pillow is lovely! I love Snickerdoodles cookies! Thanks for the tutorial. ..your pillow is so cute! I like them all- the traditional sugar cookie is really fun at Christmas. Cookie? did you say cookie?? any cookie!! 😉 but yes gingerbread is great around Christmas!! My favourites are stained glass cookies with peppermint candies and gingerbread. Love, love, love your pillow!!! The stitches give it a wonderful texture and it must feel amazing!! My favorite cookie at Christmas is Jam Thumbprints!! Thanks for sharing in the hop! Your pillows are beautiful! 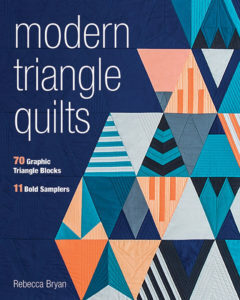 Love the colors and the machine quilting! My favorite Christmas cookie is the sugar cookie with a bit of icing. Shortbread cookies! My favorite! This is a cool project! Thank you for the chance to win and the tutorial. My favorite cookie is a Shortbread cookie . I have many, but one top runner is my grandmother's recipe called "dream cookie"
My favorite are my grandmother's recipe for lattice cookies! Mmm… Shortbread. With 100s and 1000s in it, because who doesn't love sprinkles?